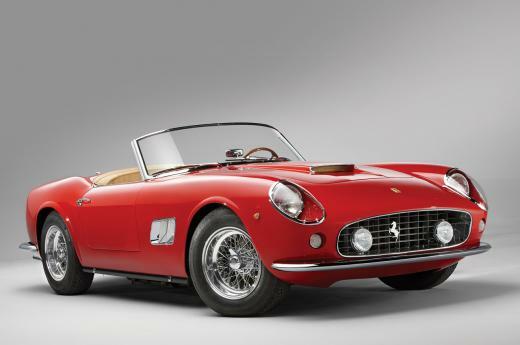 MONTEREY, CA - Monterey weekend has come and gone, and with it, a few record breaking auctions. At RM Auctions, a 1968 Ford GT40 sold for a whopping $11,000,000 dollars – yes, that’ six-zeroes! Chassis P/1074 was a Gulf Livery car that had a strong racing history and was actually a camera car in Steve McQueen’s epic movie, Le Mans. 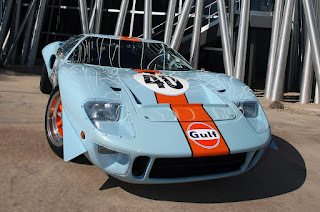 The GT40 broke the record for the highest price paid for an American car. 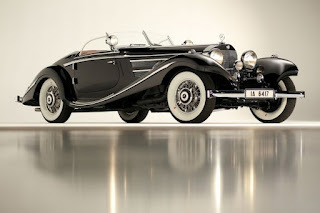 The highest priced car to sell at Monterey was at the auction house of Gooding & Co, where $11.1 million dollars bought a magnificent Mercedes 540K Special Roadster. Gooding’s also sold a Ferrari California Spyder for $6 million dollars. The total take at Gooding was $133 million and $94.5 million at RM. Mecum also sold $33 million dollars worth of cars. The number of cars sold was down, but the dollars were easily an all-time record. Also at Monterey was a tribute to Carroll Shelby, Ford assembled a collection of Cobras at Laguna Seca. There were 12 historically significant cars on display in a special tent at Laguna Seca. 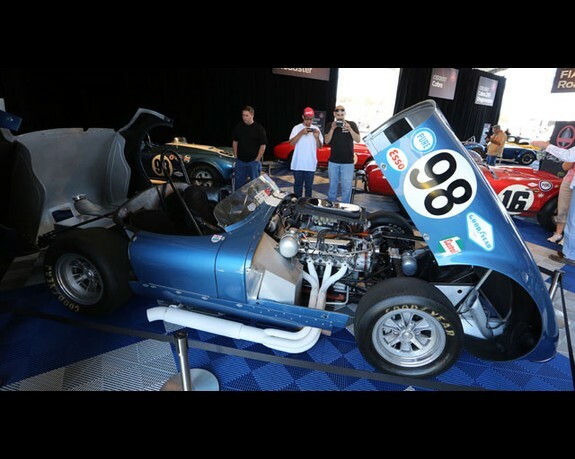 Included in the collection was CSX2000, the very first Cobra built powered by a 289 small block. CSX2196, the first big-block, 427-powered Cobra was also on display with its innovative “flip-top” body. 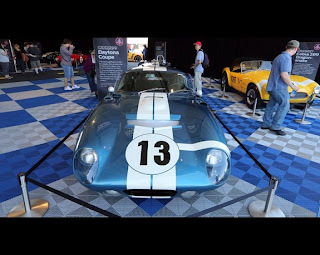 One of our favorite cars of all-time, the Cobra Daytona Coupe was on display as well. The car was the first Coupe ever-built, owned by the Simeone Automotive Museum, and the only one still in the US. The elegant lines of the Coupe were penned by Peter Brock for the sole purpose of beating Ferrari. “We went to Daytona in 1964 and just smoked the Ferraris,” said Brock. “Unfortunately we had a fire in the pits and didn't finish the race. The next race was the 12 Hours of Sebring, and we annihilated everybody there and won the race. We then took the car to Le Mans and set the lap record there and then the same thing at Spa, but the car still had some teething problems, because it was so new, but it was fast right out of the box.” Shelby won the World Manufacturer’s Championship as well as consecutive wins at Sebring and Spa. 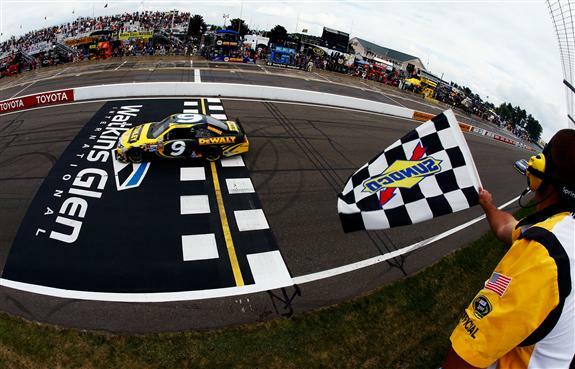 WATKINS GLEN, NY – Put 3,500 pound cars, with drivers used to turning only left, on a road course and things are bound to get exciting. 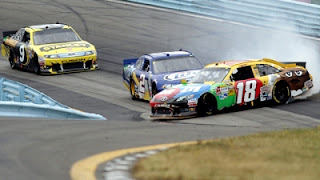 The final lap of the Finger Lakes 355 at Watkins Glen was about as exciting as it gets ( Video )! 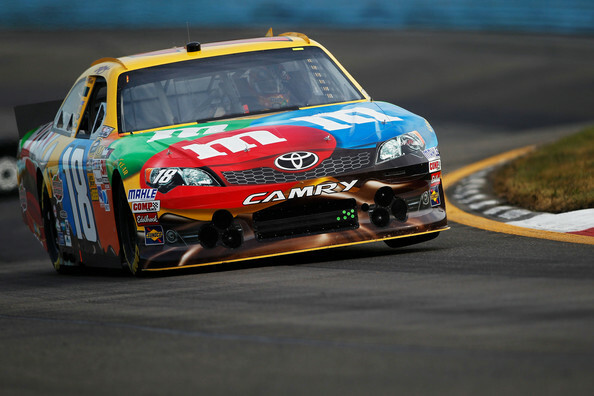 As the white flag was dropped, Kyle Busch was running in first place with Brad Keselowski and Marcos Ambrose in close pursuit. Busch looked to be having some sort of problem and was taking a defensive line into turn 1 then lost control of the 18 car and went wide. Trying to maintain his lead over Keselowski, Busch cut in front and was tapped by Keselowski causing Busch to spin into the infield at the esses. The 2 car suffered some damage on the left front and the sheet metal looked to be rubbing the front tire. Not only was the race exciting, it has made the points race exciting, upsetting The Chase apple kart. 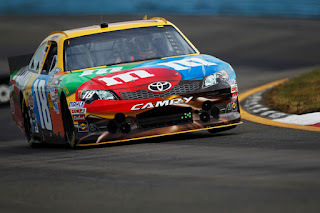 The biggest upset was with Kyle Busch who had a near lock on a Chase position, but now is a contender for a wild card spot. 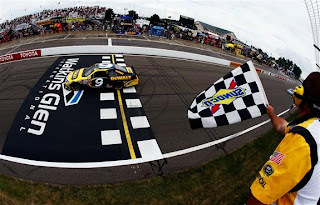 The point spread in the top three spots is only three points with Jimmie Johnson, moving up three spots, leading Roush-Fenway teammates Greg Biffle and Matt Kenseth. 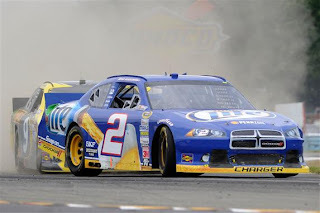 Dale Jr dropped 3 places to 4th and Keselowski’s exciting finish moved him up two places to 5th. 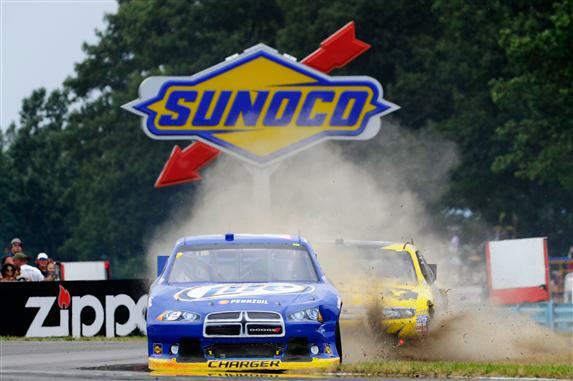 Kasey Kahne and Ryan Newman are currently the wild cards. Should NASCAR have waved the yellow flag? 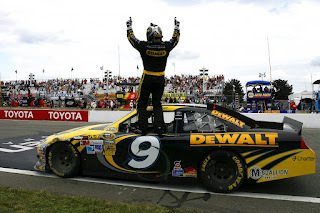 Well, in this case, I am certainly glad they didn’t because that was one heck of a great final lap! 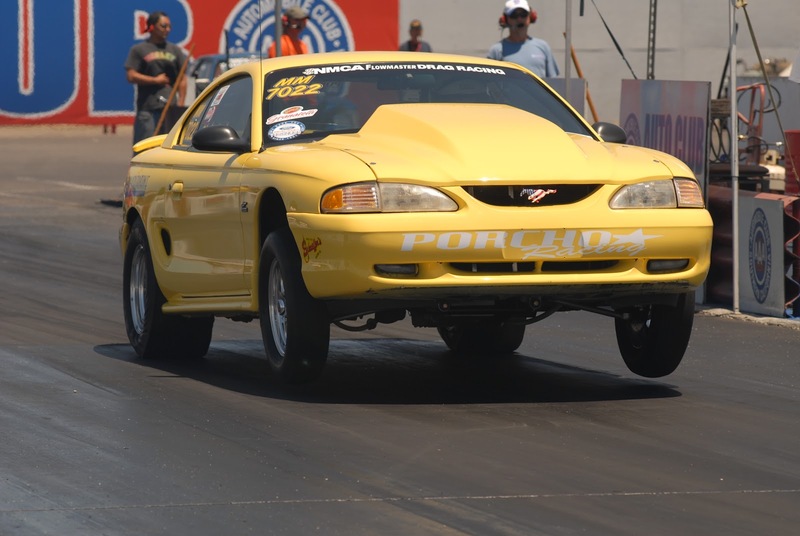 Congratulations to Dan Bott II and Stephen Porcho for their wins at the Inaugural NMCA-West Street Car Nationals held at The Famoso Raceway in Bakersfield California. 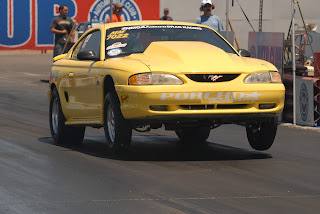 Dan won the N/A 10.5 Pro-class event, formerly known as Hot-Street. Stephen won in the in the Mustang Madness class. Dan and Steve run Burns products and are Burns Stainless Contingency winners. 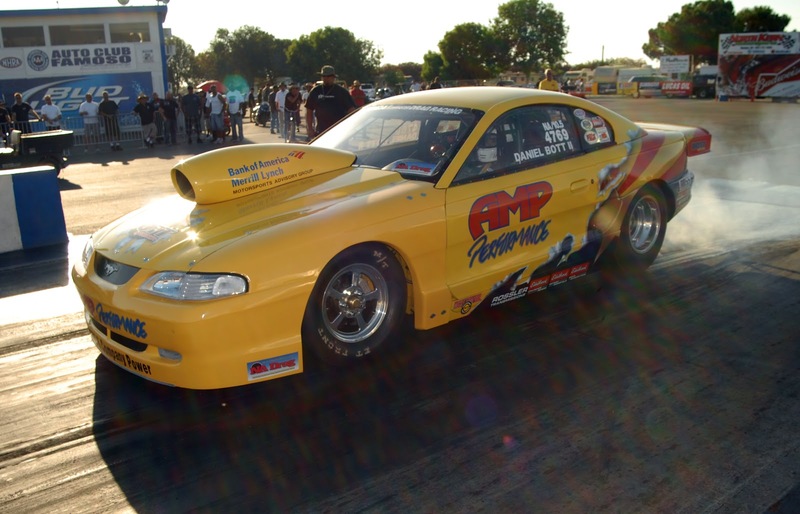 The next NMCA West event will be at the Auto Club Raceway of Pomona August 17-19. It will be an exciting race, and the winners will receive NHRA Wallys to memorialize their wins.